Understanding Synthetic versus Natural Thyroid Medications - Doctor Hermann M.D.,P.A. What is the difference between synthetic versus natural thyroid medications? Natural Thyroid formulations such as Nature-Throid, Armour, and WP Thyroid are derived from desiccated porcine (pig) thyroid glands which contain not only T4 like in synthetics but also T3. Natural thyroid from desiccated thyroid have been used to treat thyroid problems for more than 100 years as reported in medical journals and books. 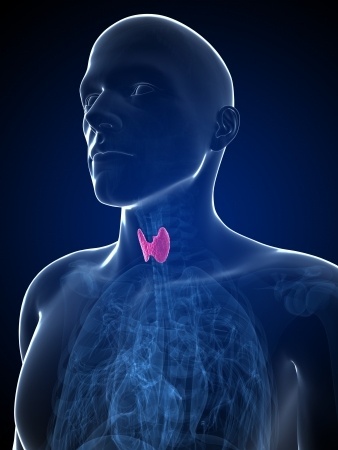 Natural thyroid formulations also target T2, T1 and Calcitonin which can be beneficial. Synthetic thyroid medications such as Synthroid and Levothyroxine contain Thyroxine (T4), which is the identical hormone produced by the thyroid gland. Synthetic formulations contain only T4 which must be converted to T3 by the body for it to work. This conversion is done by the de-Iodinase enzyme and in some people this enzyme is deficient or not working. In these patients despite thyroid levels improving the patient’s symptoms may not. Some providers using synthetic thyroid medications may add Cytomel (T3) in addition to Synthroid (T4) to try to mimic natural thyroid. However, natural thyroid is still the preferred choice because synthetic T3 and T4 still lacks T2, T1 and Calcitonin present in natural thyroid. Calcitonin production may be deficient or absent in patients after total thyroidectomy which may remove the C cells (parafollicular cells) responsible for Calcitonin. So supplementing with calcitonin makes sense and in return patients usually feel better. These patients and others feel much better on a natural thyroid medication which contain T3 and T4 and some amounts of T2, T1 and Calcitonin. In our practice most patients feel much better, with more energy, and relief of symptoms when switching from synthetic to a natural thyroid. In addition, natural thyroid seems to address other medical problems by improving immune system, aiding in in depression, lowering cholesterol, lowering blood pressure, and stabilizing cortisol levels. Some people have concerns with the stability of natural thyroid formulations. Therefore to ensure that natural thyroid formulations are consistent analytical tests are performed on the raw material (Thyroid USP powder) and on the actual tablets (finished product) to measure actual T4 and T3 activity. Natural thyroid preparations such as Nature-Throid, Armour, and WP Thyroid contain T4 and T3, plus unmeasured amounts of T2, T1 and calcitonin. The most pure form of a natural thyroid medication is WP Thyroid used to be called Westhroid Pure. WP Thyroid is gluten and corn free with no artificial colors and only contains three other ingredients inulin (from chicory root), medium chain triglycerides and Lactose Monohydrate. Nature-Throid by RLC Labs (formerly Western Research Labs) is also gluten and corn free with no artificial colors but contains many other ingredients such as: Colloidal Silicon Dioxide, Dicalcium Phosphate, Lactose Monohydrate, Magnesium Stearate, Microcrystalline Cellulose, Croscarmellose Sodium, Stearic Acid, Opadry II 85F19316 Clear, and Porcine Thyroid Powder. Armour by Activas Pharmaceuticals contains corn starch and other ingredients such as: Porcine Thyroid Powder, Dextrose Anhydrous, Microcrystalline Cellulose, Sodium Starch Glycolate, and Calcium Stearate, Opadry White, also contains trace amounts of PEG (polyethylene glycol), Polysorbate 80, and Hydroxypropyl Methycellulose. Your provider can review your history and labs to determine the best possible natural thyroid medication best for you. Hermann Wellness has multiple providers that are available to help you address your thyroid needs and determine the most beneficial treatment. Please contact our office to make an appointment in either of our convenient locations in Tampa or St. Petersburg by calling (813) 902-9559.